Age/Weight Requirements: Over 6 months and Under 35 pounds. Do Not Leave The Baby Alone! Only to be Used Under Strict Parental Supervision! •The T-bar and shaped back support helps your baby sit up safely without slipping. •There are 4 big suction cups under the bath seat, which allow it to be firmly attached to the bath and it has an easy to clean surface for hygienic bath times. •Openings on both sides, it is easily for the child to enter, so that it is very convenient to take a bath for the child. •This great bath support is full of useful features. 1.Make sure that the surface of the bath is clean before fitting the baby bath seat in the bath. 2.Press the baby bath seat down firmly to anchor all of the suction cups. 3.Before use check that the bath seat is securely fixed to the bath. 4.When adding water to the bath, first run the cold water then add hot water. 5.To ensure that the water is at a correct temperature we recommend using a bath thermometer. 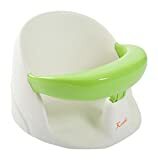 6.Suitable for babies that can sit up without assistance 6+ months.